I always consider it my lucky day when I discover or stumble upon a reptile, particularly a snake. This afternoon, the sun was sending warm rays through the cool, partly cloudy. I left the stresses and confines of my office at lunch break for a short stroll up to the pond. But not even 50 feet out the back door of my office, I spied an odd looking “stick” laying across the access road. Sure enough, it was my lucky day! This “stick” was about two-and-a-half feet long of rich copper color and bands of burgundy. Examining from a distance, I thought I had stumbled upon a Copperhead, a species of venomous snake found here in Georgia. 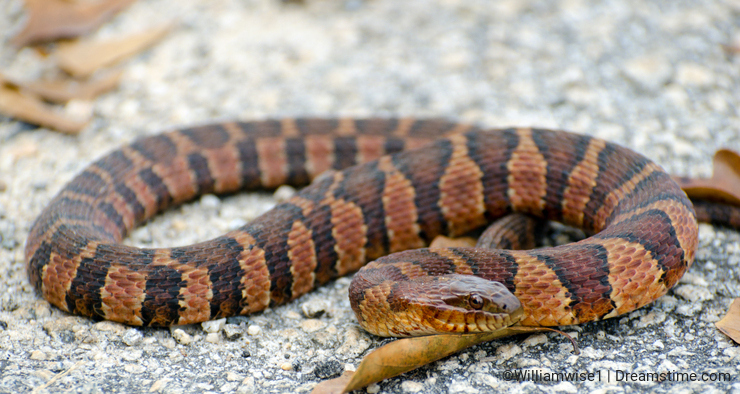 But making a calmer, closer inspection down the length of the body, I could see the bands breaking up toward the back half of the body indicating one thing: Nerodia sipedon, Northern Watersnake. There are several species of Nerodia found in Georgia. They typically inhabit a variety of aquatic habitats such as ponds, lakes, marshes, rivers and streams and primarily feed on amphibians and fish. They are often seen basking on banks of rivers or ponds or craftily hang out on branches overhanging the water. Desiring a different pose, I approached him and gently tapped his tail with my foot. Instantly he assumed the dreadful defensive position and feisty, aggressive attitude by which most watersnakes are known. After a few calculated and precise strikes at my boot and leg, he decided retreat was in order and quickly shot his way down the bank, winding toward the pond where, diving into the water, he disappeared into the watery vegetation on the edge of the pond. Truly, it was my lucky day. I like your herp shots from a fellow enthusiast. A brightly colored specimen. A lucky encounter indeed! Thanks, as usual your articles are highly educative, I would love to know as much as you do about wildlife, especially snakes, in Africa they are considered a death curse, they are wantonly killed whether venomous or harmless. Interesting, always enjoying the stories with these accidental encounters!